The Minister of Health Rosy Akbar has praised the or­ganisers of the SportsWorld Fun Run in their move to promote healthy living. She was the Chief Guest at the Namaka event in Nadi early yester­day where over 200 people from all walks of life joined in. Mrs Akbar said, the partnership compliments the ministry’s ongo­ing efforts to tackle non- commu­nicable diseases (NCDs) though health promotions and health lit­eracy. “The Fun Run isn’t a race- it is a celebration of what we can accom­plish with the help of others when we work in a team, united for a good cause and that is to promote healthy lifestyles,” Akbar said. Courts director marketing Anil Senewiratne said they haD com­pleted their fifth week of a very successful Courts and SportsWorld health and fitness promotion. “The SportsWorld Fun Run is part of the Courts and SportsWorld health and fitness promotions which aims to improve wellness amongst all Fijians,” he said. 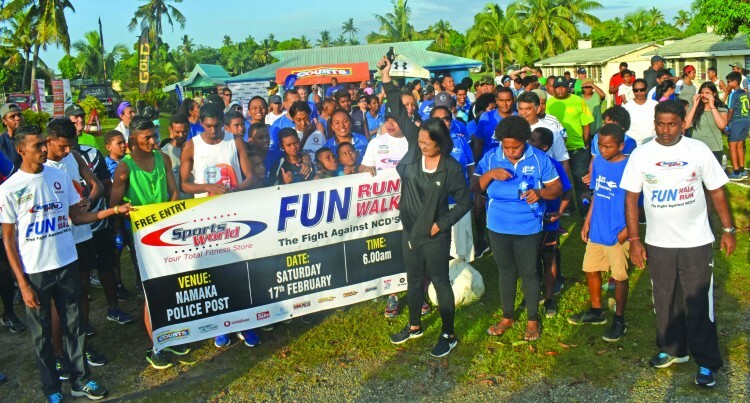 SportsWorld general manager Vi­nod Kumar said they would now take the Fun Run to all towns na­tionwide after the successful of the events in Nadi and Suva. Members of the civil service, Life Runners Church, Jet Run­ners Club and Nadi Hash Harriers were part of the event. The event is sponsored by Courts, Ministry of Health, Vodafone, Fiji Sun, Aquas­afe, Mirchi FM, Gold FM, Bula FM, 2Day FM, Rewa Life, and St John.